After a week of large, fun, great sandwiches, we thought it was time to scale back to something simple. This is a cracker, with homemade yogurt cheese, and sliced red bell pepper. It doesn’t get much simpler when it comes to food than this, plus this is a great appetizer for parties or get-togethers’. If you are making the yogurt cheese yourself, then remember to start the day before. A Kafta (or Kofta or kūfta, is Persian in origin. کوفتن (Kuftan) means “to beat” or “to grind”, according to WikiPedia. One could say that a Kafta patty is like a spicy meatball. In any case, it’s delicious, and since we recently made some, a wonderful Kafta Burger (ok, maybe more of a sandwich, given the bread) is in order. We made our own version of the traditional yogurt dressing, because we can. 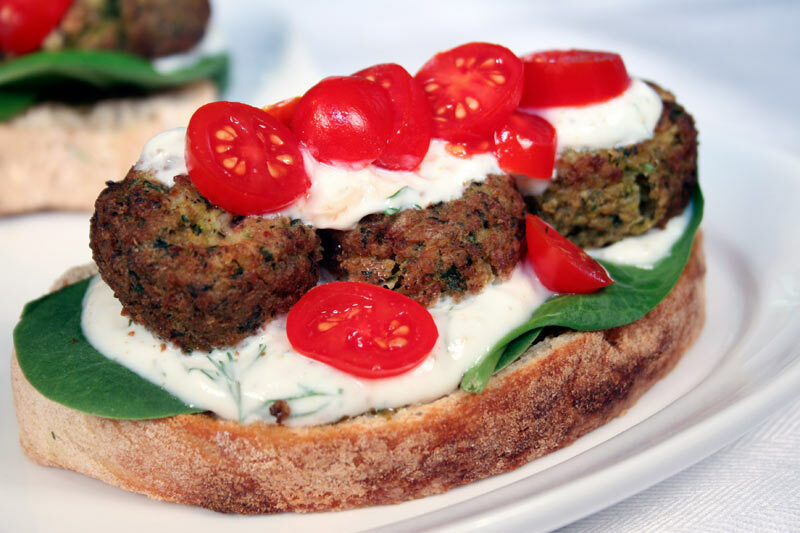 We love this Middle Eastern food so in the future expect to see more recipes like this. We think Middle Eastern food should be a food group! When all you want is a quick snack, this is a tasty in-between meals treat. The yogurt cheese and the capers make a nice pairing for the smoked salmon, and that’s really all there is to it. Very easy to make if you are hosting a party, or have friends dropping by, as long as you have prepared the yogurt for the yogurt cheese the day before.